Horses on this page are 3 years old or younger. Although too young to ride, if you are looking for a horse to train yourself, this may be the place to go. Please contact contact@fourcornersequinerescue.org if you have questions about any of the horses. 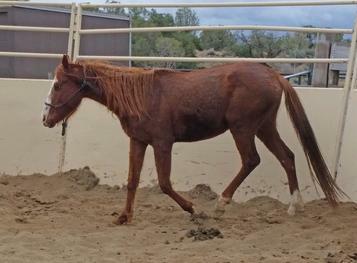 Romeo is a 2 year old Navajo Mustang gelding. He's beautiful to see and has a brain to match! Romeo is a quick learner and very attentive. He's halter trained loads into a trailer and we're working on his feet to prepare for the farrier. He's up to date on vaccinations and deworming. Romeo is one of those special horses so rare to find - he trusts people and enjoys our attention. The right home for Romeo will have time to work with him on ground work for the next year before saddle training when he's 3 years old. Nova is an orphaned filly from 2017. 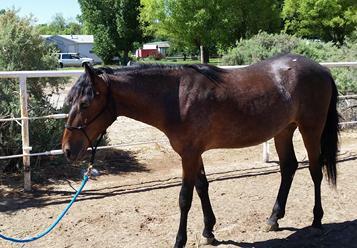 She is now a yearling, and it is time for her to continue her life's journey to a new home. 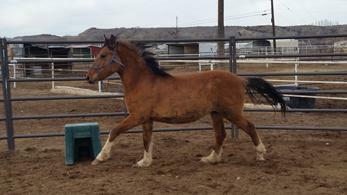 Nova is big for her age, and should mature to be 15 HH. She is bright, alert, and very engaging. Like most youngsters, Nova is full of energy, and really needs someone her own age to play with. Nova halters, leads, and stands for the farrier. Vaccinations and deworming are up to date. Rookie is a 3 year old sorrel gelding. He is new to captivity, having come from a wild band in the Pecos area. Rookie is adjusting surprisingly well, and seems to like people. He has a great personality. Rookie is now a "happy gelding" and continues his halter training. He is current on his vaccinations and deworming. He halters and leads, and we're working on feet and loading. His adoption fee includes 6 lessons with a professional Natural Horsemanship trainer for Rookie and his adopter. The adoption fee for Rookie is $175. FCER is a nonprofit 501(c)3 charitable organization, and all donations are tax-deductible.